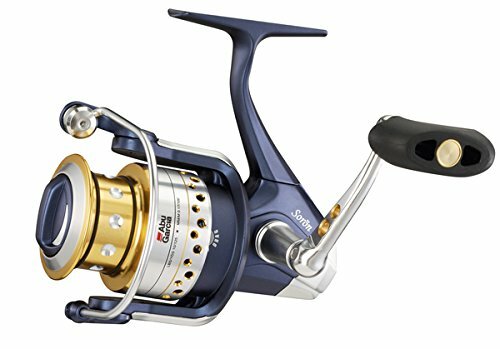 The SORON STX series of spinning reels has eleven HPCRA(r) (High Precision Corrosion Resistant) bearings providing outstanding smoothness during casts and retrieves. Duragear? gears made of heavy-duty and corrosion resistant brass add to the reel’s durability and long life. The body, body cover, rotor, and bail arm are built with X-Craftic? corrosion-resistant aluminum alloy to be super light, extremely durable, and corrosion resistant even in the toughest saltwater conditions. With our now world famous Carbon Matrix? drag system, the angler feels a solid and smooth line drag, not the erratic pull of line felt on most other drag systems. The SORA-N STX reels also include our exclusive SuperLine Spool System which eliminates the need to tape the line to the spool, and completely eliminates slipping superlines. Salt or Fresh, this is one tough reel.